BLAZE, Complete STARER KIT FOR MAKING REBORN DOLL, DVD, PAINT, KIT, MOHAIR, EYES. 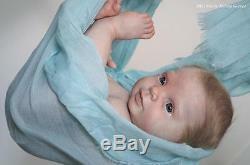 DELUXE BLAZE COMPLETE REBORN DOLL KIT. This Listing is for a DELUXE Complete Reborn Blaze kit and all the supplies you need to make him. Including a DVD How to make Reborn Dolls by Denise Pratt 90 minutes long, plus a 26 page paint by number instruction guide. Please check out my other Deluxe Complete kits as well. Picture of how the kit could look once painted and finished by you. 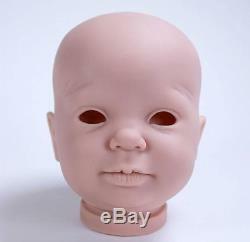 This listing is not for a finished doll but for a Complete Kit so you can make one similar yourself. See the items you will get below. Blaze doll kit comes with vinyl head and 3/4 arms and 3/4 legs. All items in this Deluxe Kit are new. Some variations in color and style of individual items may happen, as manufacture change styles, color, packaging etc. Blaze Kit by Donna RuBert. 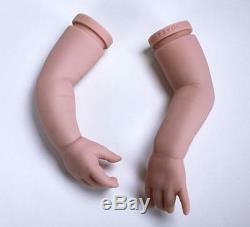 Includes UNFINISHED head, arms and legs along with rings and plugs 2. A custom doe suede Blaze body. Four pounds of glass beads (not sand) 4. One pair of nylons for containing the glass beads 5. Nine jar set of Custom Genesis Paint-by-Number Paints! Genesis Thinning Medium- 1 jar 8. Paint Brush 10 piece set for painting with Genesis paints 9. Porcelain paint palette- great for not sliding around on you 10. Nippers to cut cables 12. Super Hair Cutting and Styling Comb Razor (colors may vary) 13. 1/4 ounce of mohair (I choose color based on stock on hand) 14. Bountiful Baby Rooting Tool with 5 needles 15. Approximately 2 ozs of poly-fil 16. A Full package of Cosmetic Rounds 17. A dozen Craft Sticks 18. Cosmetic Wedges or sponge- a Full package of 28 19. 26-page Full Color Instructions to use alone or with Denises DVD. Denise Pratts DVD How to make a Reborn Baby Dolls. Sea Sponge to create mottling with. Box of toothpicks to help you clean out creases filled with paint. A package of 2 stencil bouncers. Square of Maroon felt to back the nose. Hobby Knife set 16 pieces. E 6000 Glue to hold magnetics. Magnetics 2 for pacifier (pacifier in my color choice). Eyes and Eyelashes (I choose based on hair color). I have been a reborn Artist/teacher for over 8 years. This is Deluxe Blaze Complete Reborn Kit. I recommend Mona Lisa or Bob Ross (low odor) thinner. You can find it at most craft stores. The Genesis Thinner that is included is paint , that you add other genesis paints to for areas that you want to apply thicker paint. Thanks for stopping into my little store and dont forget to check out my other items. Check out my other items. The item "BLAZE, Complete STARTER KIT make a REBORN Baby DOLL, DVD, PAINT, MOHAIR, EYES" is in sale since Wednesday, January 21, 2015. 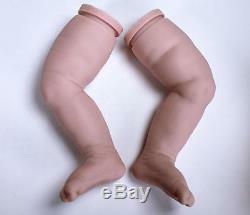 This item is in the category "Dolls & Bears\Dolls\Reborn\Reborn Kits & Supplies". The seller is "keepsakecutiesnursery" and is located in Pocatello, Idaho. This item can be shipped worldwide.